Welcome to the Avenue in Oak Bay. 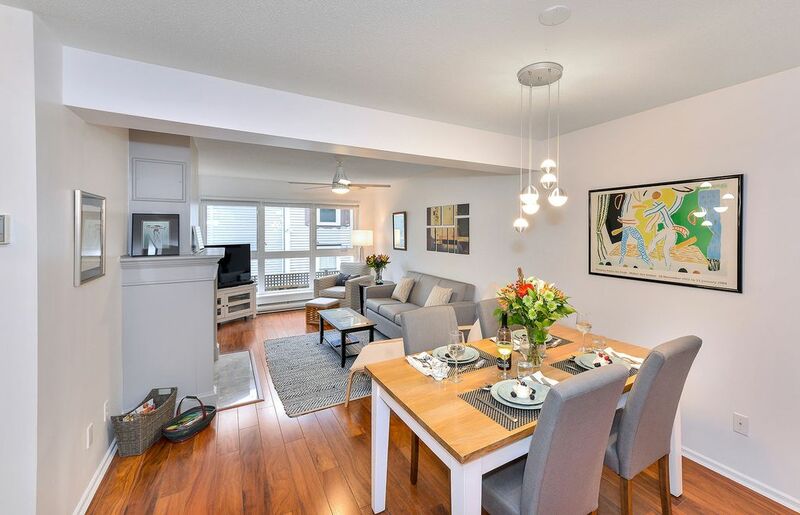 This spacious 2 bedroom / 1.5 bath is a perfect condominium for an extended stay in Victoria. Minimum 3 month rental for the months available January 1 - April 30, 2019. This property has been tastefully furnished and decorated, providing all the comforts of home not typically found in other vacation rental properties. Dining table has seating for 4, living room has seating for 5, including a gas fireplace and a Smart 50" HDTV. Kitchen is fully equipped with full size fridge, stove, dishwasher, microwave and includes your small appliances such as blender, toaster, kettle, toaster oven, espresso machine, etc....In suite washer / dryer included. Master bedroom boasts a King Size bed, with en-suite tub / shower combination. Second bedroom includes a queen size futon including bedding, as well as a desk / office work area. Your private patio seats 2 and includes a BBQ for your own use. Location, location, location! This apartment is conveniently located 1.7 kilometers to the ocean, Beach Drive and Haynes Park. The location can't be beat! There are 3 grocery stores (Save-On-Foods, Red Barn Market and Fairway Market), less than 1 km away, along with coffee shops, restaurants (Blighty's Bistro, Vis-A-Vis), pubs (Christie's Carriage House, Penny Farthing) pharmacies, banks, butcher and bakeries along Oak Bay Avenue, all within a short 10 minute walk. This east facing apartment backs onto a lovely garden area, providing a quiet space for reading, afternoon meditation and restful nights of sleep. - free local and long distance phone calls in N.A. A City Life Suites property. We have tried our very best to ensure that's what you'll find when you stay in our comfortable and convenient condo in Oak Bay. Rod and Melissa, our wonderful vacation rental agents at City Life Suites, Victoria, will be glad to assist you with your reservation and will be glad to answer any questions you may have. We have traveled extensively and have developed a keen sense of what people want when booking their travel accommodations. We have worked hard to provide clean, well furnished and equipped, affordable vacation rental apartments in Victoria, BC. For a longer stay in Victoria, this property is for you! Available for the first 4 months of 2019 (January 1 - April 30, 2019) Minimum 3 month rental, perfect for snowbirds from central and eastern Canada looking to escape their cold harsh winters. Located in Oak Bay, minutes walk to Oak Bay Village, local pubs, quaint restaurants, charming groceries, and less than 2 km to the beach! Yet close enough to the famous Inner Harbour and all that downtown Victoria has to offer. toilet, combination tub/shower, tub, Master ensuite is spacious, with tub shower combination. toilet, Main half bath has ample storage. Ensuite bath has a tub/shower combination. Main half bath located off the entrance. The Avenue at Oak Bay is 1.7 kilometers from the ocean. Smell the sea air as you stroll through Oak Bay Village, on your way to Beach Drive, Oak Bay Marina, seaside parks and the ocean. The Avenue in Oak Bay is steps away from Oak Bay Village, a quaint and eclectic variety of shops, restaurants, pubs, banks, pharmacies, grocery stores, butchers, coffee shops and bakeries. Local and Long Distance call in NA free of charge. Full size washer and dryer, stackable. One reserved secure underground parking space included in your rent. Including en espresso machine and drip coffee maker. Fully equipped kitchen with all the comforts of home. Beautiful dining table and chairs, seats four. Good selection of cable channels for your viewing pleasure. Propane BBQ for your use. The Oak Bay Suite is available for rental January 1 - April 30, 2019, minimum 3 month occupancy. It is a beautiful, well appointed suite, close to all amenities, quiet building and suite. We know you will be happy to spend your winter months here. Looking forward to seeing you! Considered one of the most prestigious of areas in Victoria, Oak Bay is a coastal community with miles of beach, boutique shops, art galleries, tasty food and wine, bakeries and coffee shops. Everything is within walking distance, including grocery stores, pharmacies and banks. This seaside community is quaint and charming, where you will find a relaxed and laid back atmosphere. Consider this well appointed 2 bedroom apartment for your stay in Victoria, minimum 3 months. Once your reservation is confirmed, we will send our rental agreement, which is a requirement to complete the reservation, with thanks.